The last couple weeks have been so busy for me, so I’m sorry I haven’t posted in a while! At least I’m back now, and I’m here with a really delicious new recipe – for caramel! I am completely obsessed with caramel, and already have two different vegan versions of it on my blog. One of them is made with cashews and coconut sugar, and the other made with coconut oil and maple syrup. I really wanted to make a new version of caramel for my blog, so I decided it was time to reinvent my maple caramel recipe, and try making it with something different – almond butter! The recipe is really simple to make, and all you need is some maple syrup, coconut oil, crunchy almond butter and salt. The chopped almonds in the crunchy almond butter add such a nice texture to the caramel, and enhance the nutty flavour. The nutty taste is generally quite subtle in the recipe, as it’s main use is to give the caramel a nice gooey-toffee like texture. The texture is really amazing, and as soon as I tried the caramel, it instantly reminded me of toffee apples. I used to have such a sweet tooth when I was younger, and I really loved toffee apples. 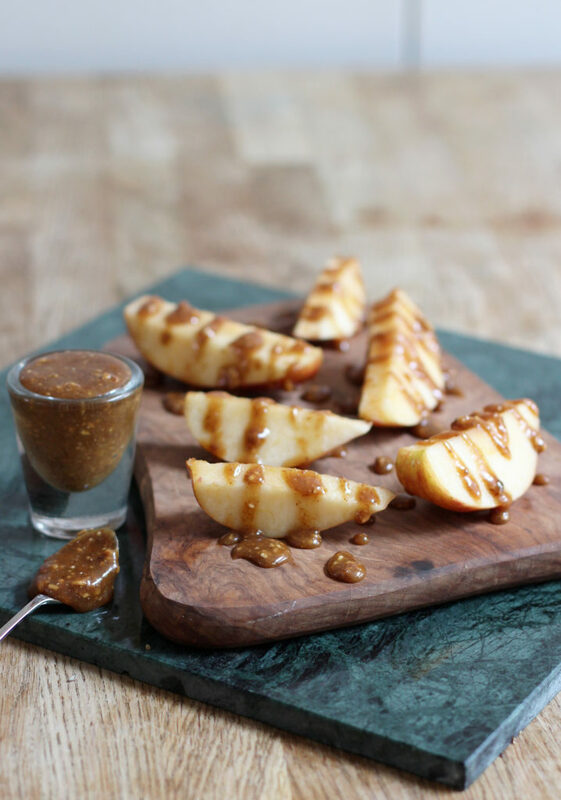 So, after tasting my almond butter caramel recipe, I knew I had to try it drizzled on an apple. 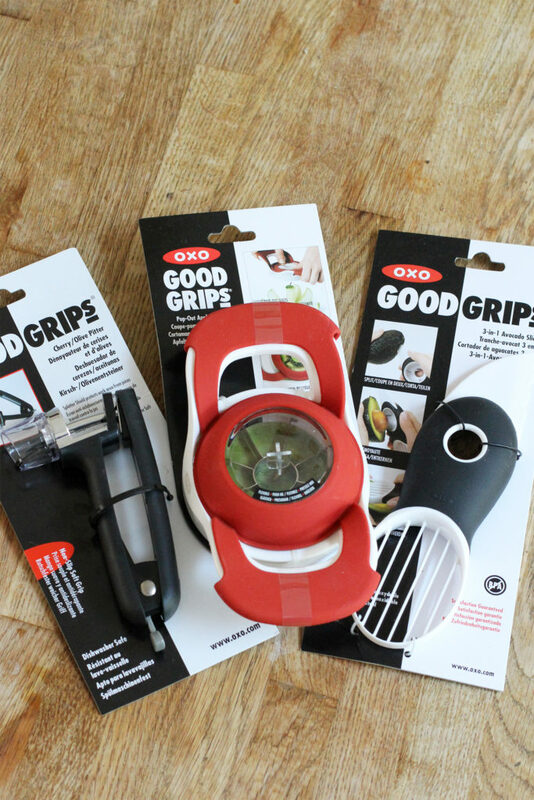 My lovely friends over at OXO recently sent me some of their new gadgets to try – a 3-in-1 avocado slicer, cherry pitter and a pop-out apple divider! 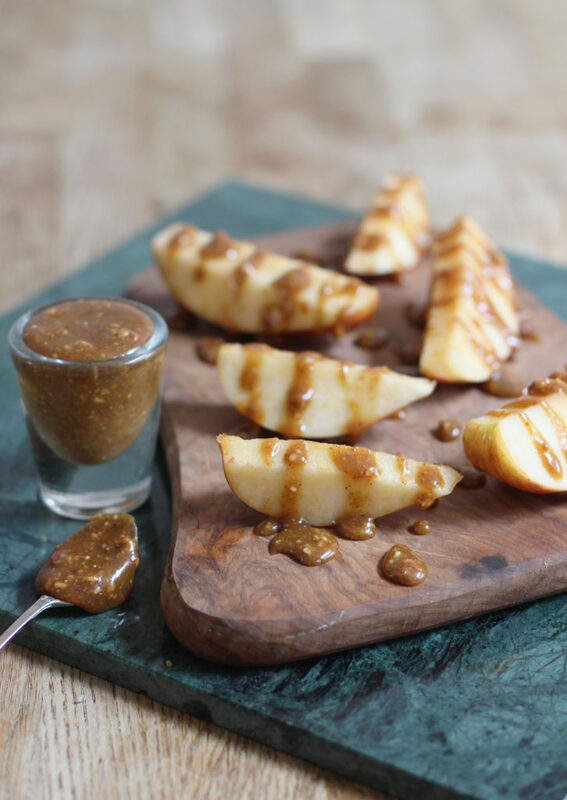 The apple slicer was perfect for this recipe, so I simply used my slicer to chop the apple up, and it was ready for me to drizzle with caramel! Yum! 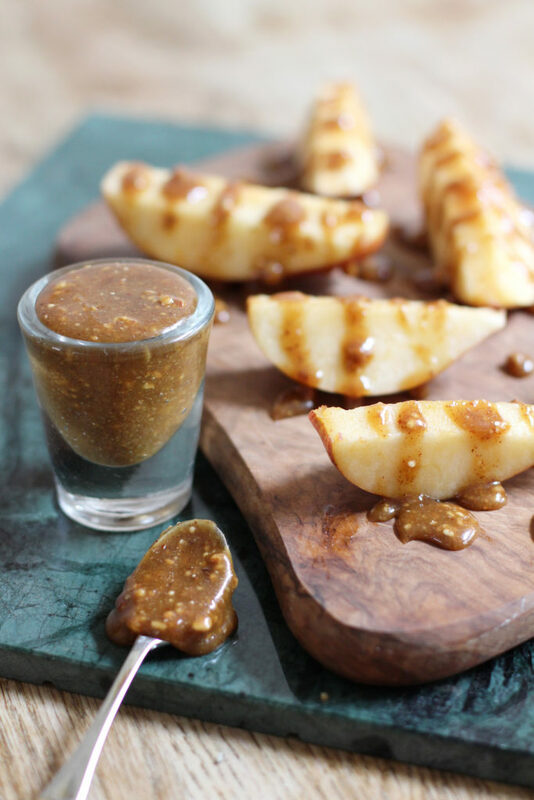 The combination of this caramel with the apple is perfect for satisfying my sugary cravings and caramel apple nostalgia! 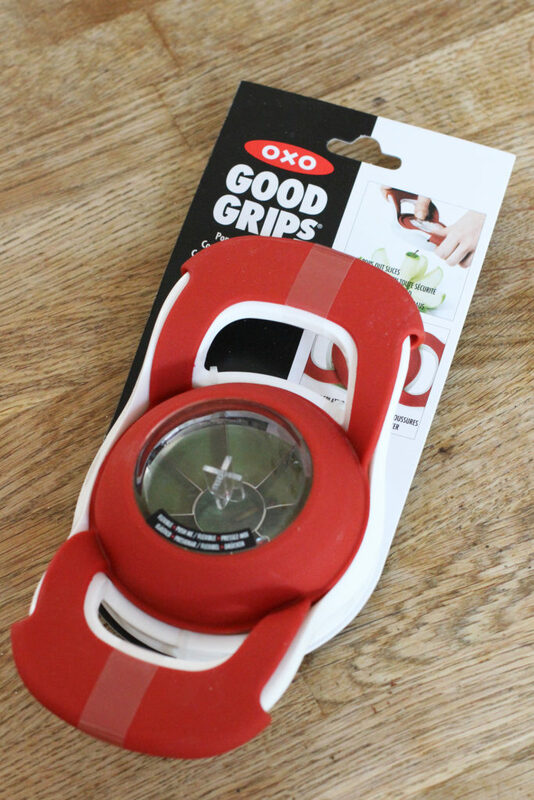 I also think the sauce would taste amazing with popcorn, chocolate, cookies or even on toast! You could also try adding some cinnamon and vanilla to it, or sprinkling some cacao nibs on top of it. I hope you enjoy the recipe! Firstly, add the maple syrup, coconut oil, almond butter and salt into a pan. Then, place the pan onto a high heat, and begin to stir the ingredients together as the mixture heats up and bubbles. Stir the mixture together for about 1.5 minutes, until the mixture has combined but is still quite runny. Then, remove the caramel from the heat, and continue to slowly stir it together for about 1 more minute until it has thickened. Then, simply drizzle it onto what you like to serve! Apple is one thing in fruits which I don’t like. So I always chop apple and prefer having along with the cornflakes. Almond butter is amazing! Thank you so much Mariana! Hehehe! Thank you so much! Thank you! Ahh that sounds amazing! this caramel looks absolutely delicious Harriet! yum! This is pretty much how I make my caramel too, but I add some dates as well. I put it on almost everything haha. This looks soooo good Harriet! I do this too all the time interchanging with almond butter and peanut butter! I also add vanilla, it is truly hard to not eat it all with a spoon, lol! I love that you added those beautiful slices with it, it’s just gorgeous and so irresistible! 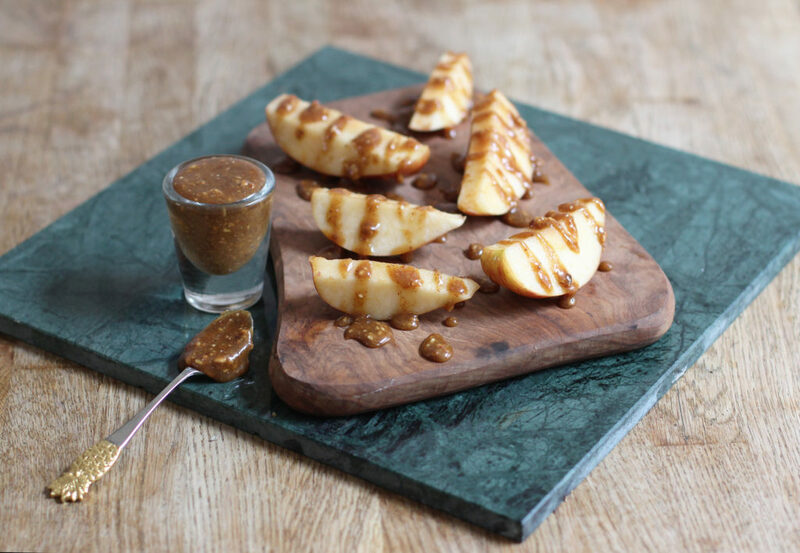 Just kidding – this almond butter caramel has my curiosity piqued, it sounds so easy and soooo delicious, Harriet! I’m also obsessed with caramel but I’ve never seen a vegan version of it. I love crispy fruit for dessert, it’s so refreshing. I love how easy and simple, healthy and delicious this recipe looks! I’ve made vegan caramel before but never with almond butter…such a good idea…i am excited to try it! I have a serious addiction to caramel too, Harriet! LOVING this one! Almond butter caramel?! OMG, sounds delicious! Can’t wait to try this and eat it by the spoonful! Cheers, friend! I am definitely trying this! I already love snacking on apples w/almond butter and I have all these ingredients. You are so creative, I really love all the recipes you come up with!